Printing your own cards? Want them to look and feel like the ones we print? Get your cards printed through Printer Studio! You're looking for the blank Poker-sized cards, but here's a link for you, all handy-like. Wow, look, you're already on your way to getting your cards printed!! Printer Studio cards come in bricks of cards wrapped in cellophane. You can determine how big you want your brick of cards to be. You can have a standard deck of cards — 54 — or maybe the size of the core deck — 162 — or anything greater or smaller or in between. Depending on what size brick you've chosen, the prices will change. The more bricks you buy the better your price is per brick. Although you can functionally order fewer than 54 cards, any stack fewer than 54 cards will still be charged as if you'd bought 54 cards, so you might as well. You want the Standard 300gsm (smooth) stock, and although it is possible to order a custom box, they are only available in brick quantities of 100 or above. A: This is where you determine how many cards you want in your brick. 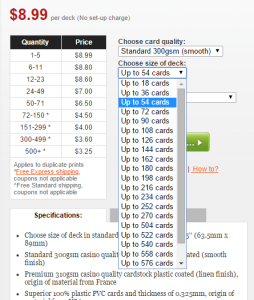 If you want to order fewer than the maximum cards for the brick you picked, you can lower it here. If you don't know how many cards you're going to need, after you've uploaded all of your cards, you can go back to this window and edit it without ruining your work by choosing the "Edit Layout" button in the top right corner of the window. B: This is where you upload your card images. You want to upload BLEED FILES ONLY, or the cards won't be full resolution. If every card in the brick is going to be the same, select "Same Image" and you'll only have to upload once. If you're putting multiple different cards in, select "Different Images" and upload them all together. C: Ignore this. We don't care about this. This is for designing the card using Printer Studio's tools, which won't work for us. Hiss, boo, ignore it. Next, you'll actually upload your files and arrange them in order. A: Remember when I said you could edit the things in the last step? "Change Layout" is where those things reside. Don't worry: changing layout won't get rid of the cards you've already uploaded or placed. B: A handy dandy button to upload your images! C: See this "Help me autofill images!" button? It's a helper. It will take the files you've uploaded in the order you've uploaded them and load them into the deck in order. However: it will only put each card in once. If you're making a brick of minipacks (for example, buying 20 Hearthswarming), you're going to have to manually drag each card in order, over and over. D: This is where you drag the cards! Seems self-explanatory. When you are done, make sure you note down where the different types of cards are. You're going to have to drag each of the card backs to the right cards in the second step so you'll want to know which ones are Ponies and which ones are Ships. See that "For number 1" above the first card there? That's how you tell which card is which: they're all numbered. This is Printer Studio's card designer again. Ignore this. This does not help us. This step is identical to Step 3, except you're uploading your Card Backs. Again, make ABSOLUTELY SURE you're uploading the Bleed files and not the Trim files. Bleed files mean there's extra border than what will be in the final product, so that if the card cutter is a little bit off, it won't cut anything important off — just more border. Make sure you know which card backs go to which cards! The card designer comes back. Ignore it. Here's where you look over your cards and see which backs go with which cards. You can see where or if you made a mistake and then you can Go Back and rectify it if necessary. At the bottom is the checkbox for your verification that you have the rights to print this game. You do. After that, all you have to do is put in your billing and shipping info and go!! We hope you have a great time printing all your cards!